CJ CheilJedang, a food manufacturing unit of CJ Group, celebrated its 30th anniversary since opening business in Indonesia, seeking to emerge as a world-leading bio firm. “Based on our business operation in Indonesia, CJ CheilJedang could develop as a global bio firm, thanks to hardworking employees at the Parusuan production line. The past 30 years will be a motivation for the next 30 years,” said CJ CheilJedang CEO Shin Hyun-jae, who participated in a ceremony in Parusuan, Indonesia, Thursday. In 1988, CJ CheilJedang established the company’s first overseas branch in Pasuruan and sold lysine, a type of amino acid for stock feed. Its yearly production increased from 10,000 tons during the early stages of business to 250,000 ton this year. Last year, the company’s accumulative lysine production surpassed 3 million tons. Buoyed by growth at the Parusuan production line, CJ CheilJedang opened a food additive manufacturing facility in Jombang, Indonesia in 1997. It expanded the business to China in 2005, Brazil in 2007 and the US in 2013, becoming the world’s first lysine manufacturer to run production facilities in South America, the US, China and Southeast Asia, the firm said. The company said it expects to report 2.8 trillion won ($2.4 billion) in sales this year, continuing from last year’s 2 trillion won sales. “Our strategy of ‘glocalization’ will continue to spur the firm’s growth, as we seek to emerge as world’s No. 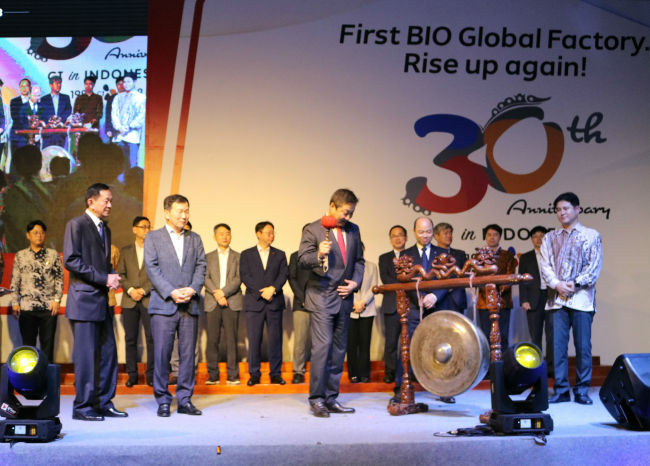 1 bio firm,” said a CJ CheilJedang official in a statement, adding that the company would maximize its market impact by expanding production facilities globally. Earlier this year, CJ CheilJedang unveiled a plan to inject $50 million into its Iowa production line to manufacture different types of amino acid products.